SLINTEC continues its journey in providing its invaluable services to strengthen the local industry research capacity. 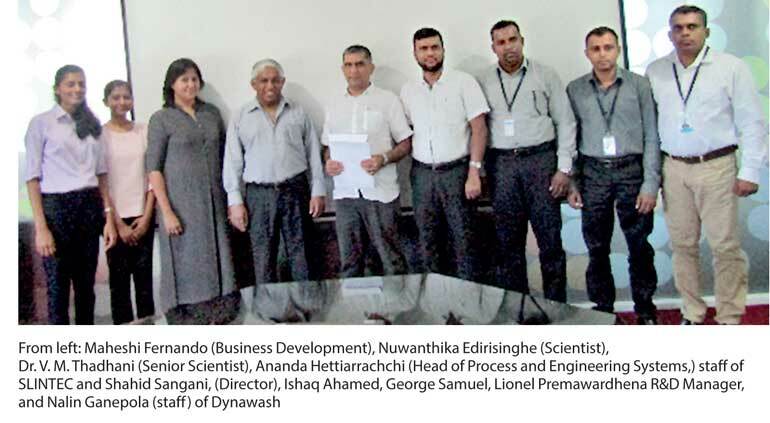 Further to the completion of a successful project with Dynawash Ltd., a company involved in the business of dyeing material for the apparel industry, an agreement was signed for the commencement of a new project with SLINTEC. The initial project helped the company to increase the efficiency in the dyeing process resulting in an improved capacity and was led by Dr. V. M. Thadhani, the Senior Scientist from SLINTEC. Dynawash, recognising the importance of R&D is seeking solutions to use natural dyes from bio-waste materials and has engaged SLINTEC in a six-month project. The same team will be involved in the second project. SLINTEC is a public-private partnership between the Government of Sri Lanka and major players in the private sector namely MAS Holdings, Brandix, Dialog, Hayleys, Loadstar and Lankem. SLINTEC is committed to supporting small-and-medium enterprises to improve and develop their products to meet the demands of the local and international markets using nanotechnology and advanced technology solutions. Dynawash has been at the forefront of providing dyeing services to the apparel sector of Sri Lanka and is also involved in providing Environmental solutions to the local industry. The company is constantly seeking ways to apply technology to improve their process and is seeking to build a strong partnership with the R&D sector in Sri Lanka.